Several weeks ago, Marines with the unit assigned to train friendly forces across African nations agreed to speak with me for a story describing how the Marine Corps’ mission there is evolving and growing as the U.S. withdraws forces from Afghanistan. 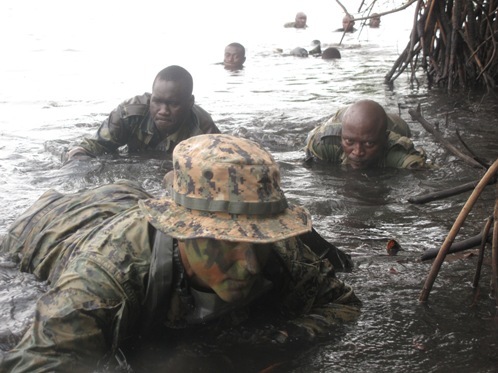 The resulting story, published here, highlights the mission in Senegal, where a force composed primarily of reconnaissance Marines have mentored commandos on everything from riverine operations to swimming in treacherous water. During our interview, Maj. Thomas Waller, then the head of the team there, described an incident in June in which a Senegalese commando was badly injured while conducting high-speed riverine training alongside Marines. The June crash in western Africa left a commando with broken bones in his legs and arterial bleeding, said Maj. Tommy Waller, head of the U.S. team there. Marines working alongside the bleeding commando moved quickly to stabilize him, and a corpsman provided treatment and called for help. The man was evacuated and survived. Seavey also has some impressions and a number of photographs posted here. Marines with SPMAGTF-Africa haven’t seen combat, but the task force’s mission has influence all over the continent. As my story points out, for example, Marines train troops in Uganda and Burundi, who in turn deploy to Somalia and fight al-Shabab, a terrorist network affiliated with a-Qaida. Think I’ll be trying to get out to see the Marines in Africa in 2013? Yep. Absolutely.